Van Heusen may be known for stitching shirts of the no-iron, fuss-free, cotton-blend variety, but the mass manufacturer, sold almost exclusively in JCPenney, does occasionally leave the safety and comfort of barn life for trendier pastures. 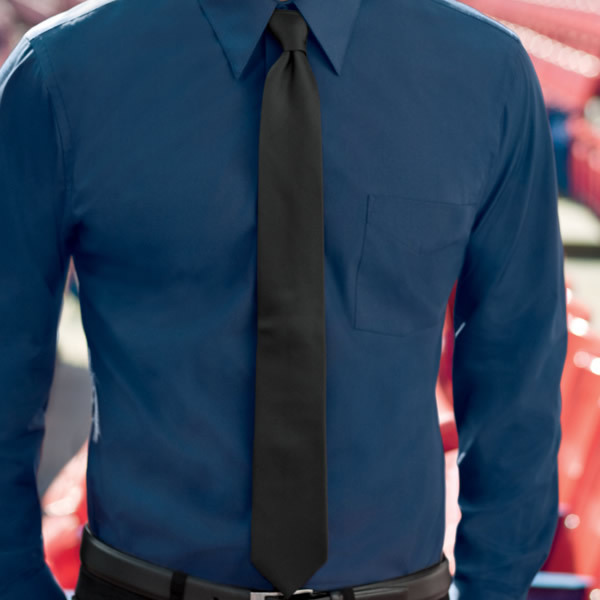 Fitted dress shirts in slimmer fits come in a palette that strays from the confines of tried and true whites and blues. Brighter colors, like jewel-toned purples, pop against subdued black-and-slate gray offerings. And when arguably one of the most basic brands in a store that breeds consistency is ready to change things up, it’s a wake-up call that everyone should be able to hear even if you’re stuck in a cornfield. Now, Van Heusen is churning out playmates for its trimmer fit shirts. Meet their interpretation of the skinny tie. It may have taken an arduous six seasons or so for the skinny tie phenomenon to trickle down from the runways into the gut of the garment industry, but the style has managed to seep under JCPenney’s doors. Van Heusen’s version takes the lobster bib width of the nondescript, 9-to-5 government-worker tie and refuses to give it a mandated one-hour lunch break. What you wind up with is a waistline that has shrunk a modest ¾". It’s a subtle change, but the results are surprisingly dramatic. And it comes in seven colors, including an unexpected solid pink and white. There is no need to cut the skinny tie loose at the end of the season. Like almost all of JCPenney’s products, this one is in it for the long haul. The tie is made from 100% silk, the steak-and-potatoes-eating daddy of tie fabrics. Colors like red, black, charcoal, baby blue, and eggplant are reliable enough for looks that run the gamut from the everyday to the eclectic. And at $24.99 a pop, they’re an easy and economical way to update your workwear wardrobe this holiday season. Wanna have them for my friend.